Best Ways to Rid Yourself of that Old Mattress for Free! Getting rid of a mattress can be a huge pain. You could leave it in the garage or attic to take up space and collect dust. Or you could toss it out to the curb and hope someone will come pick it up. Or even haul it off to the dump yourself. Not very appealing? We don't think so either. Luckily, we'll cover a few ways you can get rid of an unwanted mattress for free. Mattresses are, at the same time, the best thing that ever happened to us, and the bane of our existence. Curling into a soft warm bed after a long day is one of the most luxurious and satisfying experiences of our lives. And for most of us, it can happen every day. On the flip side, if you end up with a mattress that just doesn’t suit, you wake up every morning with a hangover and the sad realization that you did not party last night, instead you went to bed at 10:00 like a proper middle-aged man. If you are the former you have our congratulations and our well wishes that it may last you all of your days. If you're the latter then it's time to ditch the mattress. As much as you may like, it's not okay to dispose of a mattress by setting it on fire. It might be a great mental health strategy, but it also means a visit from the police. Another bad idea is to store it in the garage or in the attic. Why even bother with these half-assed steps. It's over cut the cord, get rid of it. 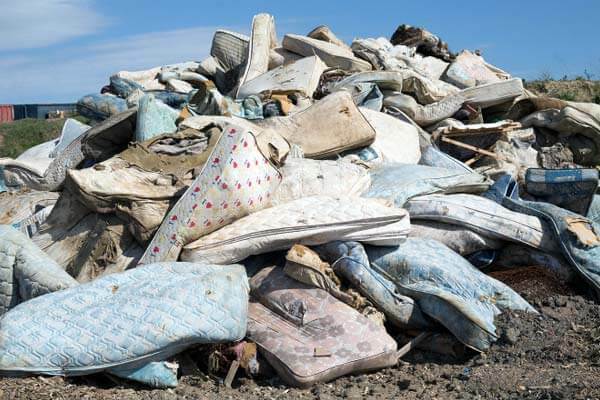 Approximately 40 million mattresses and box springs get tossed in the landfill every year in the United States. Surprising, isn’t it? Even more surprising, imagine how much space 40 million mattresses take up in our dumps. When purchasing a new mattress talk to the salesman, many furniture stores will accept your old mattress as part of their recycling program. However, it is likely the mattress will just end up in the landfill instead of being recycled. Beware the word "recycled" salesmen often use it as a synonym for "trash." Worse still, while sitting there wasting away, tossed out mattresses soak up dangerous chemicals, and create flammable air pockets. Additionally, springs pop off and get stuck in machinery causing tens of thousands of dollars worth of damage. Although you can't torch it with your flamethrower, there are some things you can do. One way to get rid of an old mattress instead of filling up our landfills is to try to sell it. Make sure the mattress is clean and stain free. Nobody wants a dirty mattress. After you have made sure it's clean you can try a site such as Craigslist or eBay, even a Facebook yard sale site. You can even go old school and post an ad in the newspaper or include it in a garage sale. Another way to get rid of an old mattress is to recycle it; really, recycle it. If it is taken apart over 90% of the mattress can be recycled. Look carefully in your neighborhood and online for a recycling center. Theses places will dismantle the mattress and recycle the individual parts. Once the mattress has been stripped, the wood can be recycled into landscaping material, the foam can be used as padding or insulation, and the metal springs are easily recycled. Everything but the mattress covering can be recycled. Repurposing a mattress is for a skilled do it yourselfer. It's not an easy turn around like say old picture frames. But if your willing to get to work there are a lot of parts that can be repurposed for other projects. Most mattresses have beautiful and useful accents like buttons and braiding. If removed carefully, both can be easily used in other sewing projects. The fabric that acts as the mattress cover can also be reused in dozens of other projects. Just like the foam padding can be used to stuff new cushions or pillows. If sewing is not your thing then try making using the old springs in the garden as fencing or trellises. Then you can take the wood frame and use the scrap wood from something truly creative. If your mattress is in good shape you may be able to donate it. With all of the sanitary bedding laws in place, many donation centers have stopped accepting mattresses. But with a little research, you can find an organization that will be happy to take it. If the mattress is free of stains and structural problems a few places will accept them as gently used and will find a new home for them. Some places that accept mattress donations are furniture banks, religious organizations, and homeless shelters. There are a lot of options when it comes to getting rid of your mattress for free. They take a little more work than tossing it next to the dumpster but all that effort pays off in the end. While nothing is going to satisfy your manly instincts like using that mattress for an epic bonfire, you might be able to repurpose it for something legendary all the same. Just be careful who you mess with or you’ll end up with a black eye. Call AZ JUNK for simple and affordable mattress removal, or schedule a pick up online. Arizona Junk Removal is a Phoenix based hauling and furniture removal company. We are a for-profit family owned and operated company who has served the Metro Phoenix area for over 10 years. How Much Does Junk Removal in Phoenix Cost?